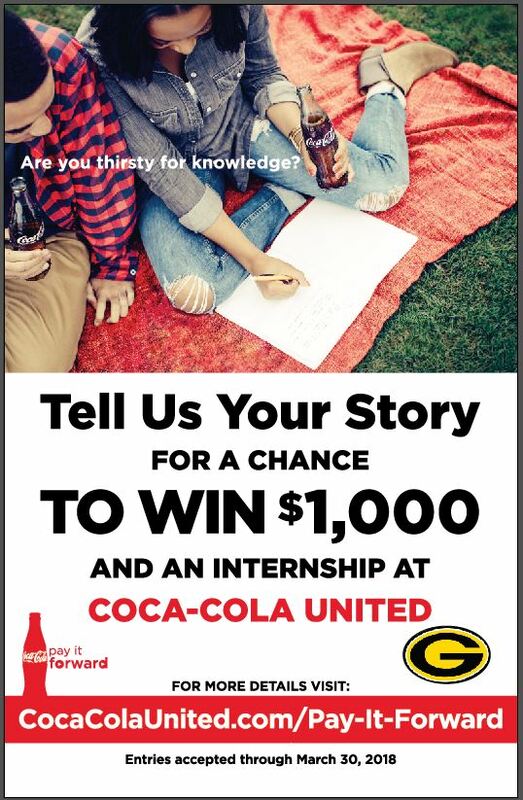 Coca-Cola United’s “Pay It Forward” internship and scholarship contest is open, and two lucky Grambling State University students will win. The company is offering $1,000 scholarships and week-long training opportunities to students from a 16 historically black colleges and universities in the southern United States where the company operates. Students selected for the prestigious program will participate in a weeklong internship at a Coca-Cola UNITED facility in Baton Rouge or New Orleans. GSU and other students selected will be exposed to a range of company roles available at Coca-Cola UNITED, including operations management, sales, marketing, public relations, human resources and accounting. The all-expenses training includes housing, meals and transportation. The contest is open to students who are 18 years old or older, enrolled as full-time undergraduate students at one of the participating HBCUs. This Internship is open to students of all majors. Applicants have a minimum 2.5 GPA. Students can apply February 1 through March 30. Grambling State students are encouraged to visit the university’s Career Services Office or the institutional advancement office to find out more. In addition to Grambling State University, participating schools include Alabama State University, Miles College, Stillman College, Talladega College, Tuskegee University, Southern University, Xavier University, Alcorn State University, Dillard University, Clark-Atlanta University, Fort Valley State University, Savannah State University, Morehouse College, Spelman College, and Albany State University. For the past two years, 10 students representing five HBCUs in Alabama were chosen to participate. The company expanded the program for 2018 to include schools throughout the seven-state footprint where Coca-Cola UNITED does business. Coca-Cola Bottling Company United, Inc., founded in 1902 and headquartered in Birmingham, Alabama, is the largest privately held Coca-Cola bottler in North America and the third largest bottler of Coca-Cola products in the U.S. Among the franchises operated by UNITED include Chattanooga, the world’s first Coca-Cola bottler, and Atlanta, headquarters of the worldwide Coca-Cola system. United has approximately 10,000 associates located in 54 sales and distribution territories, and nine production facilities, across seven southeastern states.